San Francisco is not known for its warm weather – most the time it’s between 55 and 65°, even in the summer. The only time the weather gets into the 70s and 80s is in September and October. So for the most part people look out onto their gardens but rarely venture out into them. Nobody likes sipping on a cocktail while wearing a parka. 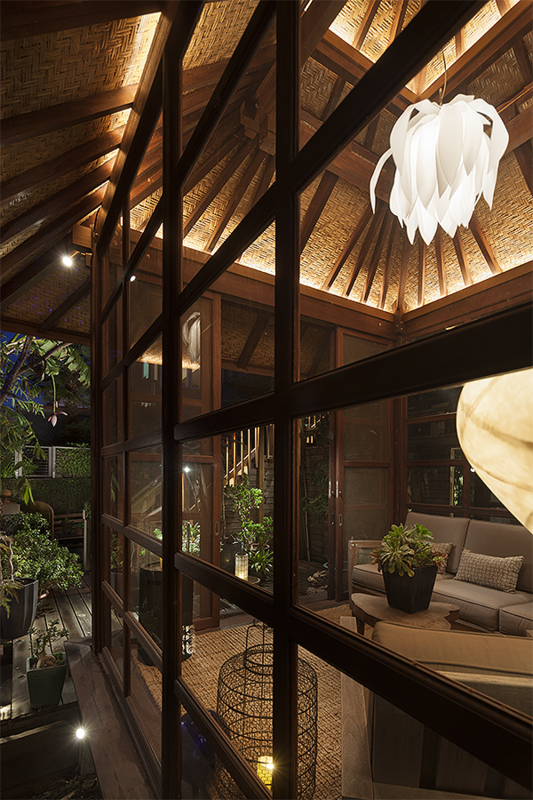 Our goal was to find a structure that gave us protection from the elements while fitting into the Asian style of the landscape design. 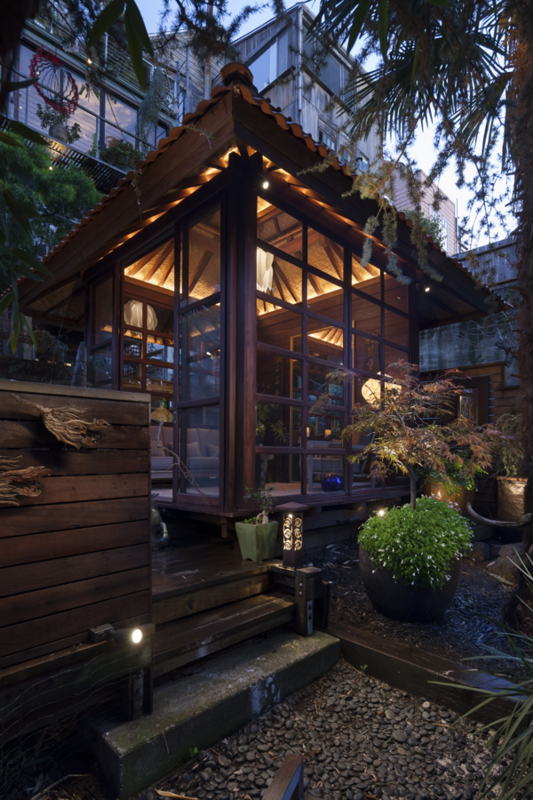 This would allow us to enjoy the garden year-round. We liked the idea of a teahouse, but only knew of Japanese-style teahouses, which normally had walls made of shoji panels which would only reveal the garden when slid aside, letting all the cold in. 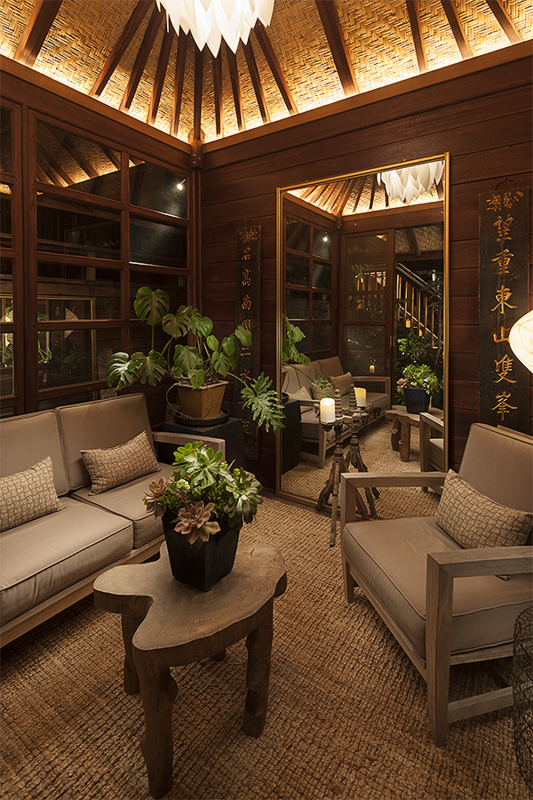 While surfing the Internet, we stumbled upon this Balinese teahouse. They are built in Bali, then taken apart, labeled and shipped for reassembly, sort of the Balinese version of IKEA. The footprint of the structure is relatively small, just 9.5’ x 9.5’, but because it has a high ceiling it feels more spacious. What really makes it feel magical and inviting is the lighting. Indirect LED linear lighting is used to illuminate the two-tiered sloped ceiling, as well as the stairs leading down to the yard. The pendant fixture, in the shape of the magnolia blossom, hangs from the center apex to help invite people inside. Subtle LED landscape lighting was used to illuminate the trees and plantings, helping to create depth and dimension for a postage stamp-sized yard.